Romania's Ministry of Foreign Affairs has strongly condemned a recent statement made by the leader of the Hungarian radical nationalist party, Jobbik, claiming that Hungary should seek autonomy for the Hungarian-populated Székely Land in Romania. According to the Hungarian agency MTI, Gábor Vona, leader of the Hungarian radical nationalist party Jobbik, accused the government of Viktor Orbán of failing to raise issues regarding the peace treaty of Trianon on the autonomy of the so-called Székely Land – or Szecklerland – with international fora. The Székely Land or Szeklerland is a historic and ethnographic area in Romania, inhabited mainly by the Székelys, a subgroup of the Hungarian people from eastern Transylvania. Its territory is roughly 16,943 square kilometres and its population is of 809,000 inhabitants, according to a 2002 census. The Treaty of Trianon was the peace agreement signed in 1920 at the end of World War I. The treaty left Hungary with 93,073 square kilometres, only 28% of the 325,411 square kilometres that had constituted the pre-war Kingdom of Hungary within the Austro-Hungarian monarchy. 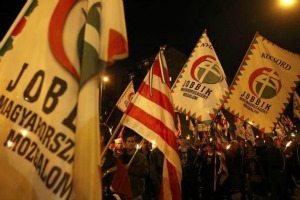 Jobbik registered as a political party in 2003, and gained increasing influence as it radicalised gradually, vilifying Jews and the country's 700,000 Roma. The group gained notoriety after founding the Hungarian Guard, an unarmed vigilante group reminiscent of World War II-era far-right groups. It entered Parliament at the 2010 elections and now holds 44 of 386 seats. Vona reportedly made these statements on 10 August at the Joseni summer camp, in the central Romanian county of Harghita. Without naming Vona, the Romanian foreign ministry “firmly condemns and rejects the statements made at the Summer Camp of Joseni”. Bucharest states that the statements made “blatantly” go “against the contemporary European spirit and realities, against the principles of the international law, the Basic Political Treaty [between Hungary and Romania, concluded in 1996], as well as those of the Bilateral Strategic Partnership”. “Such positions are completely anachronistic and must be condemned in all firmness by all responsible stakeholders of Romania, Hungary and Europe in general,” the foreign ministry states, calling on the Hungarian authorities to disassociate themselves from the Jobbik statements. In response, the Hungarian Foreign Ministry said that Jobbik was not part of the government and did not share its responsibility. The Hungarian website Politics.hu quoted Vona saying on 12 August that the Romanian press had given a “completely distorted” interpretation of his statements. In an open letter to Romanian politicians Vona said that their reactions to his remarks were “hysterical”, adding that the alliance between Romania and Hungary required “tolerance and mutually granted rights”. Vona insisted that the Romanian press represented a “false picture” of peaceful Romania and aggressive Hungary. He added that Romania’s political elite had a “bad conscience” arising from “invariably thwarting the endeavours of Hungarians in Transylvania”. The Hungarian Democratic Union of Romania (UDMR) took distance from Vona’s statements in a communiqué. It is a big problem,the european court to decide. Actually, Vona Gabor stated that his party would be ready for a conflict between Romania and Hungary. No further comment is needed. As for territorial autonomy, the requirements are very simple: a new Constitution and at least 9.5 milions of people to vote for it. conflicts with the romanian state. This is a quite rough statement , but from an extremist is less rough than from the pesident of romania , who in response wants to organize action for “teaching Hungary to know its place since Hungary has become a hotbed of instability in the region” ,claiming leadership in this action. Romanian extremists have been much more aggressive on Hungary in the close past, and no hungarian president wanted to teach romania anything. England, France, Germany, and America are most to blame for this situation, because of setting such poor examples. They did this by Intentionally waging an Immoral and Illegal war against the Serbian People to commit Physical, Cultural, and Economic Genocide on the Innocent Serbian People in order to satisfy the Racist Ambitions of the Albanians for a Mono Ethnic Greater Albania. The Video of the Journalist with a PhD that sets the Record Straight is Titled: Michael Savage exposes Bill Clinton’s lies against the Serbian people at http://www.youtube.com/watch?v=XdCCBL4WcmE . We know that England does not want to give Gibraltar back to its Rightful Owners, which is the Country of Spain. This is because England has this Centuries Long Mindset of Divide and Conquer, where they always convinced the People of Countries that Different Races should not live in the same Country, and the Latest Example of this is with Spain and Gibraltar, and we all know of Argentina and the Malvinas, as known as the Falkland Islands. There are Many People Believe the English Empire stole Gibraltar from the Spanish People who are Gibraltar’s Rightful Owners, and this is because England has a Proven History of Stealing. The Powerful English Empire made the much weaker Spain sign the ‘Treaty’ of Utrecht under Duress, which makes it Illegal under International Law, because Spain would Never have signed over Gibraltar under Normal Circumstances. It is long overdue for the English Empire, which includes its Secret Unofficial Puppet Colony of America to give the Province of Gibraltar back to its Rightful Owners, who are the People of Spain. England can begin to set a Proper Example by giving Gibraltar back to Spain, and showing that England supports Different Races of People living in the Same Country, because it is more than Obvious to Everyone that Gibraltar is Spanish, because it is nowhere near England. A Large Group of Countries need to join together to seek Justice for Spain in the International Legal Sphere, as they also need to do for Serbia if they and the Serbian Politicians have any respect for that which is respectable, in my humble opinion. Anglo-America has slandered the Innocent Serbian People and their Leaders, and Serbia needs to File a Genocide Case against England and its Secret Unofficial Puppet Colony of America, and the European Union, and share the Money with those Countries that help Serbia gain Compensation. Set the Record Straight, and tell the Truth that Slobodan Milosevic and the were Serbian People were Innocent, and suggest that America and Europe Secretly place 30 Billion Bernanke Dollars in Serbia’s Bank Account as Compensation, and along with withdrawing support for Kosovo’s Independence,. There should be no English Colonial Masters disguised as Economic Advisers for Serbia, who cannot even help their own Country, but perhaps the Serbian Politicians want someone else to blame, and to help them line their Pockets with Privatizations in Serbia and Kosovo at http://www.b92.net/eng/news/politics.php?yyyy=2013&mm=08&dd=09&nav_id=87242 . I know that the English Empire and the European Union can get Certain Politicians and Western Media to Lie and Cover Up for them, but They Will Be what Many of us Know Them To Be, until they Confess and Pay Compensation to Serbia. Nobody here has anything against anyone who wants to protect any minority’s rights; there are proper channels to do that and international institutions qualified to deal with any complaint regarding any minority’s rights. Any of those institutions wanting to check how Romania respects the minorities’ rights would be welcomed here. As for that individual calling himself President of Romania, he speaks only for himself because no one here considers him President anymore. Neither the Parliament, nor the Government, nor the people would ever condone the idiocies that individual has said. As for extremism, as long as no Romanian ambassador in Hungary has ever told you how to change your Constitution, not to mention Orban Viktor’s interferences in our internal affairs….I’ll let you draw the conclusions. @Sitara, you are right for most of your statements, but you can see that without interference in hungary romanian and other minorities are having local autonomy, even for a small village, which would satisfy the hungarian and sicler minorities too. Also you should realize that if the governement and parliament would be of good quality one, would not use minorities for electoral purposes, inflaming ultranationalists, and would make efforts for a better life, minorities would not long so much for autonomy. The same happens in Romania. Any entity has local authorities that have the right to collect their own revenues and use them however they see fit. Also, local councils have the right to make every kind of decisions as regards local communities. Some of Hungarian representatives want a status like Catalunya in Spain or South Tyrol in Italy are having and this is impossible under the current Constitution. As for elections, we don’t have elections this year and no one in his right mind would ever think to use minorities, especially the Hungarian one, for electoral purposes. Any minority is granted a number of seats in the Parliament. There are also Romanian ethnics living in the Szekler land and no one wants to jeopardize their relations with their Hungarian neighbors. We have seen how England has resorted to Gunboat Diplomacy, and Gibraltar wants to go to the International Courts with Spain, because we all know that the International Courts are English and American Puppets. England and its Unofficial Puppet Colony of America are more than Happy for this matter to go to the International Courts, because England built its Empire on the Principle that Different Races should not live in the same Country, and so it pays to Advertise. This is because England has this Centuries Long Mindset of Divide and Conquer to build the English Empire, where they always convinced People that Different Races should not live in the same Country, and the Latest Example of this is with Spain and Gibraltar. It should not surprise us learn that England and America are also Advertising this Matter using Serbia’s Province of Kosovo, and the Albanians have put the Symbols of a Non Existent Country on their Ballot Papers, in order to Advertise for England and America that Different Races should not live in the Same Country at http://www.b92.net/eng/news/politics.php?yyyy=2013&mm=08&dd=16&nav_id=87333 . The Fact that Spain signed over Gibraltar should make all of us know that it was Spanish, and because it was signed under Duress, makes that Treaty Illegal under International Law, and therefore Gibraltar is Legally Spanish Territory. Obviously, Hitler the Thug and the Thief did not Confess to being a Thug and a Thief for the Obvious Reasons, and Neither will his Accomplices in Crime over Stealing Czechoslovakian Owned Sudetenland, because they have a Vested Interest, and in this case it was the Majority of the People of Sudetenland who were German. We all know that the then Government of Czechoslovakia had to sign over Sudetenland to the German Third Reich, and it was done under Duress, which is Illegal under International Law, and this is how it happened with Spanish Gibraltar, and while Sudetenland went back to its Rightful Owners which is the former Country of Czechoslovakia, the World is waiting for Gibraltar to be returned to its Rightful Owners, who are the People of Spain, and the People of Gibraltar at http://en.wikipedia.org/wiki/Sudetenland . It is Undeniable that Many People Globally see that Gibraltar is Spanish Land, and that it should be Returned to its Rightful Owners who are the People of Spain, and the People of Gibraltar. We all know that the Gibraltarians are being propped up Financially with English Taxpayers Money, and so this is why 98.5 % of Gibraltarians Voted not be part of Spain at http://en.wikipedia.org/wiki/Gibraltar_sovereignty_referendum,_2002 . The Non Albanian Voters of Northern Kosovo voted 99.7 % Referendum not be part of in a Non Existent Country of Kosovo, and if you saw the Video in my first comment, then you will understand the Reasons for that, and it is because All Non Albanians would be Ethnically Cleansed from an Independent Kosovo at http://en.wikipedia.org/wiki/North_Kosovo_referendum,_2012 , and the reasons for this are explained in this short Video Titled: History of Kosovo at http://www.youtube.com/watch?v=Y-_QHbUGW6Y . We can see the Difference between North Kosovo and the Non Albanians of South Kosovo, and the People of Gibraltar, and History tells us the Difference between those who have Principles and those who are Easily Compromised. The Only Difference between the English Empire and the Third Reich, is that the English Empire were Hitler Lite and Hitler Refined, but Hitler Nonetheless. England was Cunning enough to invent the Subterfuge of American Independence to Lure Spain, France, and the Netherlands to help the Americans gain their Independence from England, as the People of America said that they had a Right to be Independent of England. England did not Recognize the American Colonies Right to decide for themselves, but the entire thing was a Hoax known Only to the DNA English Elites of both England and America. The Secret Unofficial Puppet Colony of America was able to add Spanish Colonies in Mexico and the Philippines to the English Empire, and England did not get the Blame for this. We know that England did the same thing with Hong Kong, but the 99 year Lease Expired, and England had to let Hong Kong go back to China, and there was no Referendum in Hong Kong. Even though England may point to what they Falsely Claim to be a Legal Claim over Gibraltar, which we know is Illegal under International Law, the Facts remain that England’s Moral Claim over Gibraltar is almost Expired, as are the Fake Excuses of the People of Gibraltar. England treatment over Gibraltar is like asking the Nazi Guards at a Concentration Camp to hold a Referendum over whether what they are doing is Right and Legal, and the Prisoners do not get to Vote because they are Considered to be Sub Human, and this is why all the Voters of Spain and Gibraltar should decide the Future Status of Gibraltar, because the Spanish People are not Sub Human, regardless of what the English Empire Secretly thinks of them. These are the Facts, and Many People hope that the Good People of Gibraltar can be persuaded to do the Right Thing, for they too are Citizens of the European Union.